OMG Tightwad loves repurposed stuff; especially home-related. She loves how things are given new life and purpose and... how clever is this? 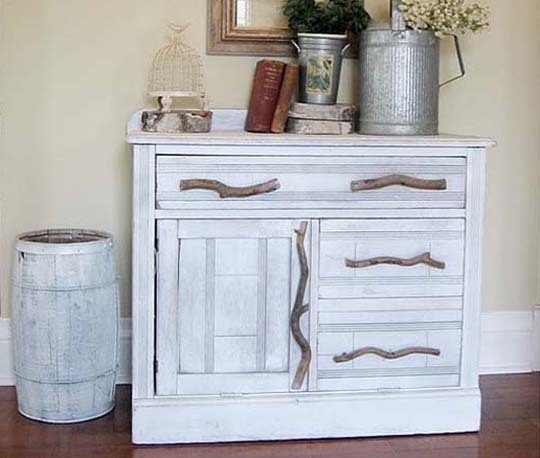 Lisa over at Recaptured Charm re-invented this sweet cabinet. At first Tightwad just admired the use of branches for handles instead of traditional hardware, until she discovered how inventive it was; complete with a cat flap and built-in ventilation, Lisa created the prettiest litter box ever! See here for more info. If you want to be mentioned in Tightwad's repurposed series, send her an email at tightwad@gmail.com.